Besides labour laws, implementation of proper reforms in other areas such as subsidies, can lead to overall job gains rising to 110 million over the next 10 years, the largest for any major economy, Goldman Sachs said. As general elections draw closer, global financial major Goldman Sachs on Friday said 40 million new manufacturing jobs can be created in a decade if states follow flexible labour laws like in Gujarat. The observations assume significance as they come at a time when a political debate is underway on the comparison between growth model of Narendra Modi-led Gujarat and that of other states ruled by Congress and other parties. Modi is the Prime Ministerial Candidate of the Bharatiya Janata Party (BJP), which is trying to wrestle power from Congress at the Centre. The report said, the Gujarat government amended the Industrial Disputes Act in 2004 to allow for greater flexibility in the labour market for Special Economic Zones (SEZ). It allowed for companies within SEZs to lay off workers, without seeking the permission of the government, by simply giving a 1-month notice to the worker. In contrast, the West Bengal government, made several pro-worker changes. It changed the laws to make it virtually impossible to shut down a loss-making factory. Accordingly, Gujarat has experienced a 60 per cent growth in manufacturing employment between 2000-12, while West Bengal has seen only a 22 per cent increase. Goldman Sachs said as a new government takes charge from mid-2014, it sees labour market reforms as a critical ingredient to accelerate India's economic growth rate. "If India were to undertake significant reforms in the labour market, the benefits could be quite large," Goldman Sachs said. In a bull scenario, it projected that India could add some 110 million workers over the next decade. At this level, the number of jobs that India could create would be larger than that of the US, China, Russia, and Brazil combined, Goldman Sachs said. 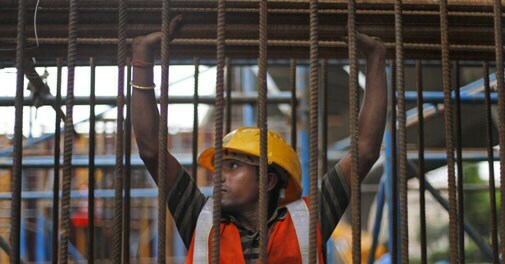 According to the financial services firm, India's stringent labour laws are a key factor constraining employment growth and the reforms like simpler labour laws, more flexibility to hire and fire, self certification by the employers, amendment in Trade Union act and faster dispute settlement, are likely to increase flexibility and boost employment. India's employment growth in recent years has been anaemic. The economy added only about 2 million jobs each year between FY05 to FY12, compared to 12 million a year in the 5 years before this period, it said. "As a labour abundant country, India should be generating jobs in labour-intensive manufacturing," the report said. India has some 44 labour laws which are enacted by the central government and enforced by both the central as well as state governments. In addition, there are also labour laws enacted and enforced by the various state governments. Some laws date back to the colonial era. The Trade Unions Act is from 1926, the Workmen's Compensation Act is from 1923, and the Factories Act from 1948.